» Guardrail ends: Don’t hit them! 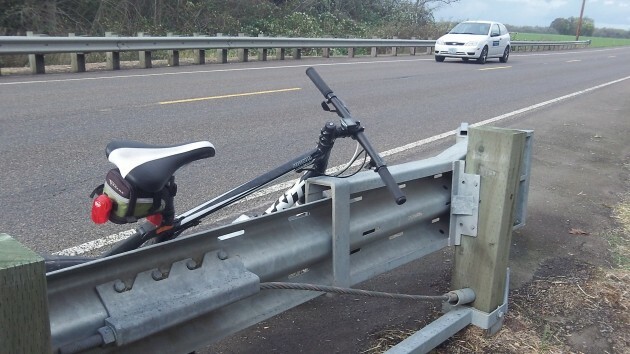 Guardrail ends: Don’t hit them! A guardrail end terminal on Highway 99E south of Tangent. We’ve all seen them, those yellow and black end pieces of highway guardrails. And you may have wondered, as I have, why they are so blunt and what would happen if a car veered off the pavement and hit one. Now we know, sort of. They are built that way to make collisions less catastrophic than they might otherwise be. But it doesn’t always work. In Texas last week, a jury awarded $175 million in damages in a lawsuit against Trinity Industries Inc., one maker of those guardrail “end terminals.” A competitor had sued the company under the federal “whistleblower” law, charging that Trinity had failed to disclose to the government that it had made a slight change in its “ET-Plus” guardrail terminals, a change that allegedly degraded its intended performance. Trinity was quoted in the news as planning to appeal. The terminals are supposed to absorb the shock of a frontal collision and peel the guardrail off to the side. Footage shown on TV showed that instead, in a few cases the rail speared through the vehicles and in at least one case cut off the driver’s legs below the knees. The Federal Highway Administration has ordered Trinity to provide new safety test data on its terminals. 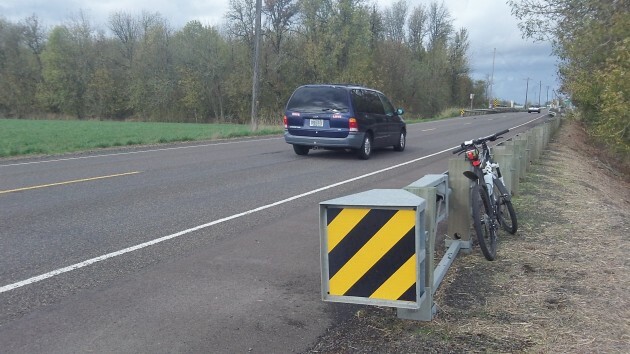 And in Oregon, the Department of Transportation removed the brand from its list of approved guardrail ends. ODOT says it is reviewing crash data to see if any of Trinity’s ET-brand terminals were involved. Only 909 or 4 percent of the 22,539 guardrail terminals in Oregon are of the ET-brand made by Trinity, according to ODOT. Last week the department was awaiting further information before deciding whether to replace that type of terminal. The 909 include older ET terminals as well as the newer ET-Plus type involved in the Texas verdict. The construction of this end terminal looks pretty solid and hard to break. Tags: guardrail end terminals, Highway 99E, ODOT, Trinity Industries Inc.
Years ago I hit one on a federal highway at speed limit. Some demon grabbed the wheel. I was okay. The car was totaled. The cop cited me for crossing the fog line. I then had to pay for the damage to the barrier, about a thousand. It was not visibly damaged but I think it was on the principle of hitting a telephone pole. There even if you just bump it you owe about 10% of the CAPEX. So, yah, do not hit the end point, but my best guess in this case was I can be really glad it was there. Oh. My insurance would not cover the barrier CAPEX chargeback. As best I understand the CAPEX charge was fully proper. Maybe if they made really sharp & pointy, people would pay more attention and the end result would be more positive?